LETTERS FROM SHEPPEY: Johnny Kingdom R.I.P. It was sad to see that Johnny Kingdom was killed recently when a digger overturned while he was working on his farmland in his beloved Devon. He was 79, lived most of his life on and around Exmoor and was one of those countryside characters still steeped in all the old ways that you rarely see or hear about these days. 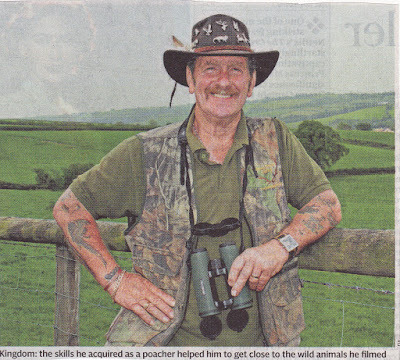 Throughout his life Johnny was a farm labourer, poacher, quarryman, lumberjack and gravedigger and in his latter years, an excellent maker of wildlife documentaries that were shown on BBC2. In one hand he probably had more knowledge of the countryside, it's wildlife and weather, than all the presenters on the awful BBC Countryfile put together. He came from the mould that made the likes of Jack Hargreaves, Olly Kite, Phil Drabble and several others, people that didn't need a script, fancy clothing and make-up to present a wildlife programme. I had a lot of time for him because he spoke of a countryside and it's ways that I can identify with and have dabbled with throughout my life. I was aware of, but not familiar with him Derek, although Jack Hargreaves, who you mentioned, was a staple of my childhood years. An unlikely TV personality but he was so talented with a camera. I remember the programmes and how he was able to buy more land for wildlife. sad loss and in a bad way too - not that there is a good way. He was a rounded man and a wonderful presenter. I agree with your comments about modern "country" programmes entirely. They are what a metropolitan lot from inside the M25 think the countryside should be. Glossy, pretty and politically correct!